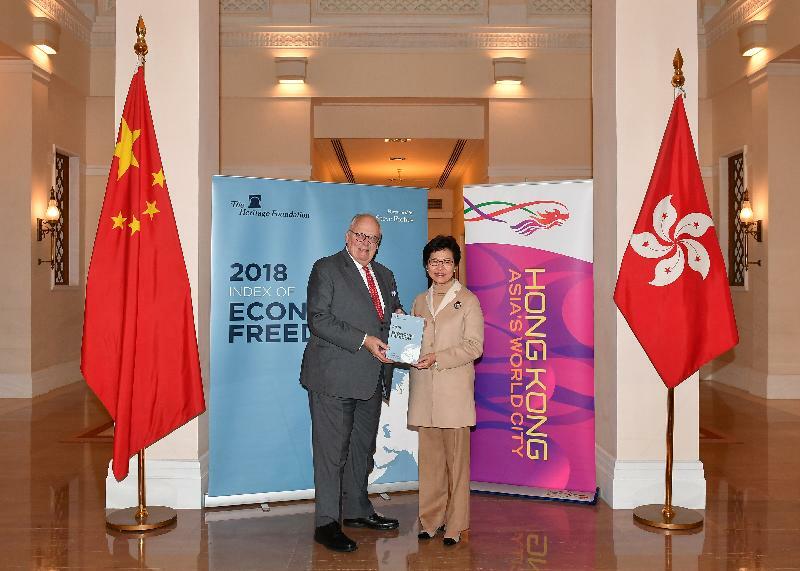 The Hong Kong Special Administrative Region Government today (February 2) welcomed the Heritage Foundation's (the Foundation) ranking of Hong Kong as the world's freest economy for the 24th consecutive year. In this year’s Index of Economic Freedom report, Hong Kong's overall score improved by 0.4 point to 90.2 compared to last year, making Hong Kong the only economy with an overall score of more than 90. The Financial Secretary, Mr Paul Chan, said, "The free market principles have long been the cornerstones of Hong Kong's economic prosperity and international competitiveness. I am glad that Hong Kong has been ranked the world's freest economy for 24 consecutive years. Our steadfast commitment in upholding the free market principles in Hong Kong is again affirmed internationally." Among the 12 components measured in the report, Hong Kong achieved high scores of 90 or above in eight, and obtained top scores in Fiscal Health, Business Freedom, Trade Freedom and Financial Freedom. The Foundation recognised Hong Kong's economic resilience, high-quality legal framework, low tolerance for corruption, high degree of government transparency, efficient regulatory framework and openness to global commerce. Mr Chan added, "Notwithstanding the continued improvement in Hong Kong's performance in the latest report, the Government is well aware of the keen competition across the globe and we must constantly endeavour to keep ourselves competitive globally. The Government will strive to uphold Hong Kong's strengths, including the rule of law and judicial independence, a simple and low tax system, an open and free trade regime, a level-playing field for all businesses and an efficient public sector. In addition, the Government will inject new impetus for economic growth by enhancing the business environment, promoting innovation and technology development and forging closer economic and trade ties with other economies, so as to strengthen Hong Kong's leading position as an international financial, transportation and trade centre." The 2018 Index of Economic Freedom report was released by the Heritage Foundation today. Hong Kong has been ranked the world's freest economy every year since the Index was first published in 1995. On a scale of 0 to 100, the overall rating of Hong Kong in this year's report was 90.2, 0.4 points higher than last year and well above the global average of 61.1.